Ruben Amaro Jr.'s first trade as Phillies general manager was for John Mayberry Jr. Given the fact that Mayberry is the leading candidate to become the Phillies' starting leftfielder next season, the GM's initial acquisition of a fellow Jr. and Stanford graduate appears to be quite a steal. Greg Golson, the outfielder sent to Texas for Mayberry and now in the New York Yankees' organization, is showing no signs of being worthy of a first-round pick, while Mayberry is looking like a classic late bloomer. Less than a month after the Mayberry trade, Amaro made Raul Ibanez his first free-agent signing, giving the 36-year-old outfielder a three-year deal worth $31.5 million. Ibanez, of course, replaced Pat Burrell as the Phillies leftfielder the year after they won the World Series. Now that Ibanez's contract has expired and he is once again a free agent, we can debate the merits of that move and also discuss whether it would be a good idea to re-sign Ibanez at the right price. It says here that Ibanez, despite a disappointing 2011 season, was a good signing. It also says that he would be worth bringing back on a one-year deal of about $4 million, especially if the price tag is too high for somebody like Michael Cuddyer. Making the case for Ibanez's value over the last three years is easy. He was a definite upgrade over Burrell, who, at 35, appears ready to retire because of a chronic knee injury. 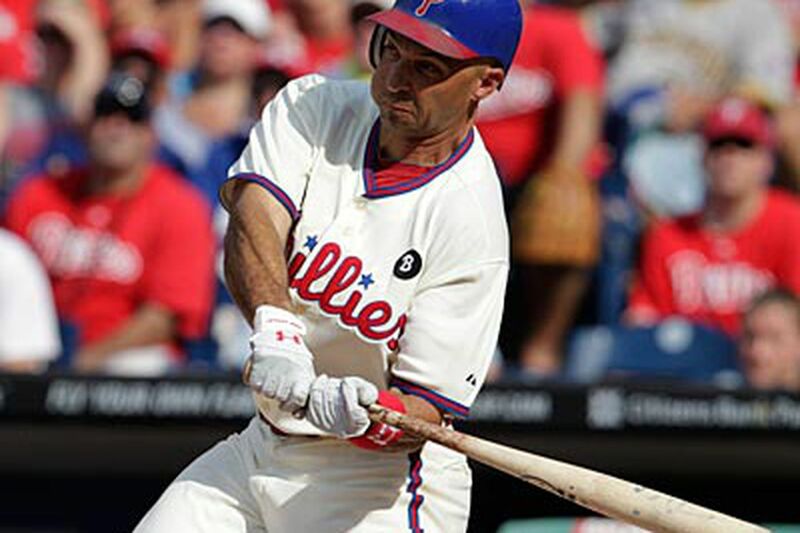 For the first half of his first Phils season in 2009, Ibanez was worthy of MVP consideration. That's when he went from being Raul Ibanez to being "Raaaaaauuuuullll!" A groin injury just before the all-star break that year stripped Ibanez of his star status. He was never the same player in terms of production after that injury, but he was always the same player in terms of effort, which is why he remained a fan favorite even as his star dimmed. In the eyes of his general manager, Ibanez's Philadelphia story was a success. "Had he not gotten hurt after the first half of that first season, he was headed for an MVP year," Amaro said. "While his production wasn't always consistent, at the end of the day he was still a pretty productive player. "After the injury, he got a little bit streakier, but I always loved the way he played the game. I loved what he brought to the table in the clubhouse. He's exactly what we're looking for as far as makeup and the way we hope a member of the Philadelphia Phillies performs off the field and in the clubhouse. He adds another dimension that way. I'm not sure how measurable that is, and I know he'd like to be more consistent." Ibanez's clubhouse value, age, and inconsistency all must be weighed if the Phillies want to re-sign him. At the moment, it's an issue on the back burner while the front office sorts through more pressing business. Shortstop Jimmy Rollins' free-agent situation understandably is a greater priority. "There are a lot of things that we're holding off on right now," Amaro said. "We'll see how things shake out with Jimmy. Even if Jimmy is or isn't part of our club, some of the other things we might end up doing could be rather modest." That's why there is still a chance Ibanez ends up back with the Phillies. Cuddyer's cost is going to be high, and he'd be more than an insurance policy for Mayberry. Before Jayson Werth became the Phillies' regular rightfielder in 2008, former general manager Pat Gillick signed/overpaid Geoff Jenkins as the lefthanded bat at that position. Ibanez would provide similar insurance while Mayberry tries to prove he belongs in the lineup on a daily basis. "We have talked about letting John be the primary guy and getting some protection against a tough righty," Amaro said. "Raul could possibly be that guy, but at this stage we have other things to take care of before we make a commitment like that." Ibanez, who will turn 40 next season, wants to continue his career and fell in love with the Phillies and Philadelphia during his three seasons here. "I'd describe it as an extraordinary experience," he said. "They were some of the best times of my baseball career. I remember after hitting a home run early in that first season, all the fans stood up in left field and started chanting my name at the same time. I remember the hairs on my arms stood up. I had the hair on my arms stand up more in the last three years than I did during the rest of my career." Ibanez still believes he can be an everyday player in the big leagues, but was asked if he'd consider a reduced role if it meant remaining in Philadelphia. "We'll have to see what happens," he said. "It would depend on what a reduced role meant. If it's defined the right way and I'm still playing a significant amount of time, I'd be open to that. If a reduced role meant I'd never play, I don't have any interest in that." Ibanez batted .245 with a .289 on-base percentage last season, and both numbers represented career lows since he became a regular with Kansas City in 2002. He still had 50 extra-base hits, which ranked sixth among all leftfielders in baseball. He averaged 58 extra-base hits in his three seasons. Only Matt Holliday and Ryan Braun averaged more among big-league leftfielders during that time. Still, Ibanez was not happy with his third season in Philadelphia. "This last season was one I'm not particularly proud of," he said. "I'm looking forward to redeeming myself to myself. In my mind, as a professional, it was unacceptable, and I look to correct those issues and flaws. I expect to be significantly better next season." Ibanez, a career .280 hitter, believes his problems stemmed more from approach than age or injury. "I don't think I consistently hit the ball to the opposite field," he said. "That's been one of my strengths throughout my career and one of the reasons I've always been able to hit for a fairly high average. Not being able to dominate the center to the left side of the field created some issues for me." Now Ibanez is a free agent with an uncertain future. "Ruben did a very classy thing," he said. "He called me and thanked me right after the season and I thanked him. I think the door on both sides remains open, but they have things they're going to prioritize. I know the door on my side is still open." at bbrookover@phillynews.com or @brookob on Twitter.